« NEW BONAIRE PORTUGUESE SPANISH BOOKLET LAUNCHED! Launched in July, the Bonaire Photo Contest is an attractive event that maintains much exposure for Bonaire in Latin America. The contest is actively promoted in Brazil, Colombia, Venezuela, Argentina and Mexico. This second edition is running successfully in Spanish-Portuguese and now English, and invites past and new visitors of Bonaire around the world to participate. TCB-Latin America is receiving beautiful pictures from Amateur and Professional photographers in the underwater and top side categories. Prizes that were donated by our sponsor companies on island include; one week stay on Bonaire with breakfast, car rental and unlimited shore diving for two people. Sponsor companies benefit with all the promotions the contest is generating. Beautiful posts are being published reaching up to know 1,838 followers at Bonaire Photo Contest’s Instagram account @bonairephotocontest. Our photography contest ended November 20th. By December 16th, TCB-Latin America will announce the 8 winning photos selected by International and Local Judges in Bonaire. 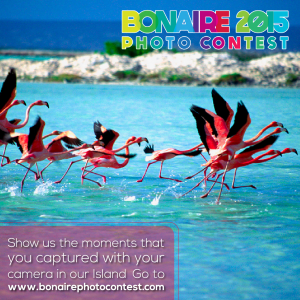 Follow us at www.bonairephotocontest.com and @bonairephotocontest Instagram account!